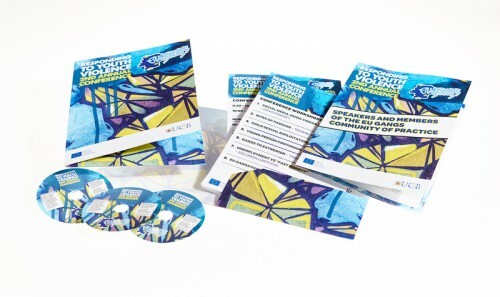 We recently designed a programme, schedule, DVD and folder (to house it all) for University College Birmingham’s second annual EUGANGS conference on responding to youth violence. The design and colour ways were influenced by the existing EUGANGS logo and brand. We used an attention-grabbing graffiti backdrop, stencil type lettering and added spray textures to give a bit of depth. EUGANGS is a collaborative project whereby professionals from five countries, have to research, develop and accredit a new professional or vocational qualification for those working in Gang and Youth Crime environments across Europe.